I sometimes feel like talking in riddles like this when speaking with people about how to grow an ecommerce business as the underlying problems stunting growth are rarely technology focused. Sure, technology may be an issue and need improving, but technology didn’t get there by itself. You see, the challenges most businesses face when it comes to growth is actually nothing to do with technology or understanding or anything external for that matter. Information is free, if you have the time you can learn anything from cooking to rocket science from the many MOOCs that are available from Universities around the world. Likewise, the problem doesn’t lie with budgets either as I can guarantee that if for every £1 you gave me, I would give you £2 back, you would bite my hand off and empty your wallet without question. The underlying problem is what Spoon Boy (he really needs another name doesn’t he!) was talking about. It’s about perspective, specifically how you perceive things VS how they actually are. It is how you perceive the challenge and how you deal with the problem which ultimately decides your fate. Do I go to McDonalds or go to the gym? It’s all a choice. And choices start in your head. There are a few good books that I always recommend people to read, firstly because they are awesome and will help to expand your mind, but also because these types of books help you to think differently about a problem. Instead of seeing everything as a challenge with a never ending amount of barriers stopping you from progressing, instead, think differently about the problem and solutions will manifest. When you have already decided on a solution before you have articulated the challenge or problem, you’ve already lost. Outline where you are going, what you want to achieve and let the team of experts you surround yourself with recommend the best solution. It is your job to allow this process to happen, or not. As a business owner or marketing manager you are likely extremely swayed about website design and development based on how it looks. I am here to explain to you why this is no-where near as important as you think it is. This is not to say that this isn’t important, it is, but it isn’t the be-all and end-all. When making decisions around technology, what you really need to be asking the questions about is technology, frameworks, scalability and adaptability. All of the technical aspects you probably would prefer not to get too involved with as this is what you pay the web guys to take care of, right? Unfortunately, the reality is that when you ignore these key aspects you end up with an all fur coat no knickers solution which is going to cause you tremendous pain in the long run. Trust me. It is often at this point where we pick up projects, when they have gone seriously wrong in the past when these aspects have been ignored, often because you asked for a pretty looking website or made a decision based purely on how something looks or made a cost-based decision. 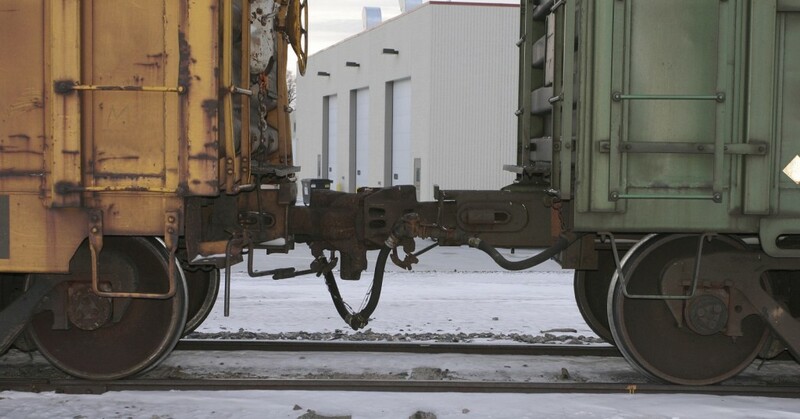 Here is when we pick things up and straighten things out which is a costly process. Below we’re going to talk through many of the aspects you need to be asking questions about before you even start to think about the design of your website. When you get the below aspects right from the outset, you can make your website look any way you desire. And most importantly, you can chop and change the look of your website on a daily basis should you wish as you have the flexibility to do so without being restrained by poor technologies. It is essential that your website is powered by a leading Content Management System. A platform which allows you to control most of the aspects of your website yourself, without requiring a developer to implement changes. For 99% of businesses out there you have two choices really, WordPress or Magento. Poor quality web hosting is going to harm the success of your business. It’s cheap for a reason, it’s restrictive and not that good. Leading web hosting has security built in, is regularly maintained and is backed up in a remote location should anything go wrong. I can promise you that if you don’t take cyber security seriously, your website will be hacked into at some point. A pretty looking website which can be hacked, deleted and changed by an unauthorised person trying to do your website harm is no good to anyone. A framework is essentially a set of rules for how things are implemented. A back end framework is all around how the server side code is implemented to ensure the code is easy to maintain, easy to extend and easy to work with in general. Think of a back end framework as a separation of concerns, read up about MVC if you’re really interested. Using the correct back end framework for your website ultimately determines how successful your website project will be or how many problems you will face in the future. Just like back end frameworks, front end frameworks deal specifically with how your website looks on the front end. Just as with all frameworks, you need to work within the limits of the framework which is why getting this part wrong can result in simple changes not actually being so simple in the end. Discuss this with your web developer about how things are built to understand the potential pitfalls further down the line. When using any kind of 3rd party solutions as part of core functionality on your website, it is absolutely essential to make sure these are chosen with quality in mind. Cheap and free is like this for a reason, it’s likely absolutely awful and will cause you many problems down the line. To a certain extent, the speed of your website is determined by how much you are paying for your web hosting. You cannot expect the speed that you experience on Google, Facebook and Twitter when paying budget web hosting. It’s just like buying a car, the more you pay, the faster it goes. Sure, there are optimisations and tweaks that can be made at the server level to further improve performance, although in the grand scheme of things these are a bit like spoilers and go-faster stripes on cars, they help, but aren’t going to do much on a Peugeot 205. You want to be able to edit as much as possible on the website, right? Well this hugely depends on the technology you’re using. Certain frameworks will give you more control for you to edit things yourself, others will restrict that control meaning that you have to pay a web developer every time you need to make a change. A costly process over time. You want your website to work seamlessly across all devices, right? Well this again doesn’t just happen by magic. This is a conscious decision and requires strategic planning to make sure that your website performs in the way that your customers expect. Only now do we start to think about the user experience on the website. Why are people using your website? What are they aiming to achieve? How easy is your website to navigate? What do people like about your website? What do people dislike about your website? How can things be improved on a regular basis to improve performance? It’s all of these questions you need to start asking about your website and business as a whole. Once you know what your website visitors are looking to achieve, how are you meeting their needs through the content that is available on your website? Are you still dealing with common queries for products and services over the phone? It is this type of content that at the very basic level could be handled by a more sophisticated setup on your website. Think differently about content. Content is not for Google and SEO, content is for your users. Now we come onto the branding aspect. Once you have all of these aspects above in place, now it is time to start looking at how your website actually looks. At this point, once you have all of the above items in place, you can make the website look and feel any way you like. Get any of the above items wrong and you will extremely restricted based on what you can or can’t do at this point. You see, the branding aspect is the icing on the cake for website design. No matter how good your website looks, if your key ingredients are rotten, your website isn’t going to perform and your website visitors are going to be able to see straight through that. There is a lot more to website design and development that you may first think. Never assume that your web development team is going to be doing everything right. If you ask for a pretty website, that’s what you’ll get, a pretty website that has been built poorly and doesn’t perform. When you ask a web development team for a website that achieves your business goals, you’ll get a well-built platform for you to work towards your goals much faster. The choice is yours, never skip over asking the difficult questions about website technologies. Welcome to 2016. After reviewing the physical post received for the first week back in the office, I can only sit here with my head in my hands pondering why businesses are still failing to grasp how fast the world is really moving around them and adapt accordingly. We’ve our usual tips and advice blog post on their way for what you need to be focusing on in 2016 for your digital strategy, but in the meantime I feel the need to express my opinion on the state of what can only be described as utter junk that had been posted out to me and the company. Please, just stop. As you can see above, this is just a small selection of the garbage that was received, promotional pens labelled as “The Mythic Stylus Pen”, OK, I’m sure I know what one of these is, it’s not a unicorn walking down the street of Manchester blowing rainbows from its backside for f. sake. 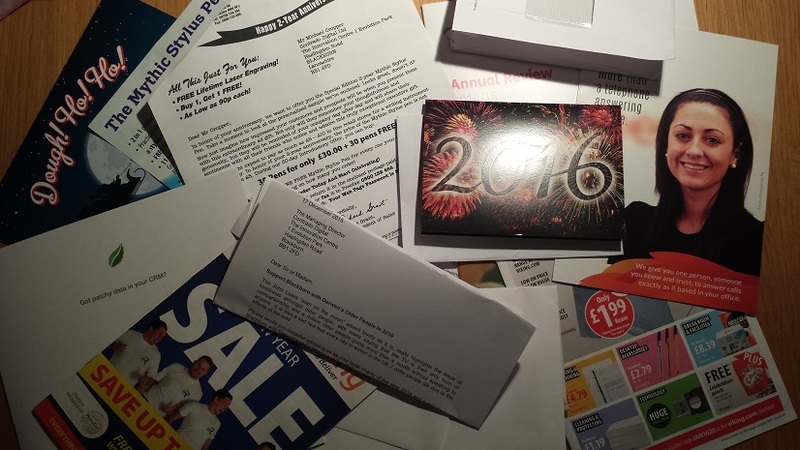 Sale catalogues, promotional material, wall planners, seriously who uses wall planners in 2016? Come on folk, please stop this. All of this junk received went straight into the bin. Stop wasting your money on junk and start to market your business effectively through digital channels. We live in a digital world, it’s time to bring your business into the 21st century. Onwards and upwards. No more Same Stuff Different Day garbage. Think differently, revolutionise your business with digital channels and opportunities for your business to flourish in 2016. The same activities from the last 10 years quite frankly aren’t going to cut it in 2016. We see a lot of WordPress websites as you can imagine with WordPress development being a core service we offer. Within these WordPress websites we see an awful lot of baggage which is limiting the growth of the website and is often caused by poor technology decisions earlier on. This post is designed to help you understand what the common issues we see are, what they mean in non-technical terms and most importantly what you can do to avoid these same problems in the future. If you have been sent this link from a member of staff, then the likelihood is that you have unfortunately made the wrong technology decisions on your website 1-2 years ago which is now coming back to bite and it’s unfortunate that the only way of dealing with this is to bite the bullet and implement the right technology which comes at a cost. Instead of us keep explaining the variety of reasons why something cannot be implemented effectively on a website, we’ve decided to put together this guide to outline this information in more depth which can be referred to by everyone and to hopefully avoid others making the same mistakes as we see so many businesses make. Hmm. Yes, WordPress core functionality is indeed free and if you want your website to look like it was free then you are more than welcome to give this a go yourself. I’m going to tell you a little story here about a boiler person fixing a problem to highlight what you are paying for. So you are sitting at home all cosy and all of a sudden your boiler stops working. You go to the boiler, try and re-pressure the boiler, tap on the dials a bit, press a few buttons and then you are still no wiser as to what has happened or how to fix the problem. So you decide to call out a boiler engineer. The next day the boiler engineer comes around to your house where you then explain the problem to them and it is a common problem they have dealt with many times before. By the time you have offered to make them a cup of tea, they have given the boiler a couple of taps and everything is back to normal again. They hand you an invoice for £150 for fixing the problem and just before they leave you have a question running around in your mind and decide to speak up. You say, why has this cost me £150, you’ve only been here 5 minutes? Ah, the boiler person says, it is not the time you are paying for, it is the expertise to be able to fix this problem within this small amount of time. It’s about knowing exactly where to tap on the boiler when this problem occurs. You see, you could quite happily have spent days searching around the internet trying to solve the problem for yourself or had a junior boiler engineer come around and fix the problem over 6 hours, but with me, with me you get many years of experience and vast expertise so that this problem can indeed be fixed in as little as 5 minutes. You see, anything is simple when you have the experience and knowledge to do so. The trick is, acquiring this knowledge and experience over a number of years takes a dedicated amount of time and effort. Website development is no different. Premium plugins and themes are awesome and you need to understand that this is the way the WordPress ecosystem works. It is the reason WordPress websites are so cost effective in comparison to building your own custom build technology. The difference between buying a premium plugin VS building this functionality yourself is the same difference between buying a high performance car from a showroom VS building your own car from the raw materials. You just aren’t going to do that are you now? For the cost of premium plugins, you would never even contemplate building your own functionality if you can simply purchase this and it does exactly what you need as it would cost 10-50x more to do this manually from scratch due to how complex WordPress actually is in the background to get things working correctly. You want your website to be up to date and secure, right? This is what you are paying for. Premium plugin and theme developers continually keep their technology up to date, add features and functionality along with patching security holes that have been identified. When you decide to save a few pennies on your technologies, you will be bitten in no time when your website is hacked into by an automated robot. We’ve seen this happen too many times and we will quite happily help to clean this up for you when this does happen which will cost you more in the long run. This has to be one of the biggest issues we see for businesses. To keep things simple and straight forward, you must use a child theme if you are making any customisations to your theme! It really is this simple. Ok, so what is a child theme? A child theme a way of customising your WordPress website, generally by the developer who built it, whereby you can override key functionality in a safe way. As mentioned previously, security updates and feature addons to themes come out all the time, so it is important to keep these up to date. If you edit your theme directly, when you press the friendly looking “update” button, you will be left with a shocking surprise when all of your customisations have been deleted. Again, we’ve seen this happen time and time again. What this means for business owners is that you need to check that your WordPress website is being built by a reputable developer in the first place and also that they are going to be using a child theme for any customisations that are made. If not, then when someone else takes this on, such as our self, there can be no guarantees that a theme update will not cause any issues. A simple theme update could actually cause days if not weeks worth of work to fix critical problems just to get your website looking how it was looking previously. What often happens is that when businesses come to us, we explain that a website hasn’t been built using a child theme, that we cannot guarantee no issues and really they are going to need to redevelop the website. Which often is a little confusing to hear as they only wanted a few simple changes to be made. The reason why this is required is because if we press the nice little “update” button and cannot guarantee that updates will no break anything, then we will be left with the situation of having to clean up the mess from other developers which we are not willing to do and is something that often you would not be willing to pay for as you would see the situation that we have broken it. When in fact, the problem lies with the poor technology choices you made previously. If your website has not been customised with a child theme, the short answer is always going to be that you need to get this redeveloped properly. Unless you are 100% confident that you or your previous web developer has not made any changes to the core theme files and that you are willing to pay extra for when things break and have to be cleaned up, then the only option is to rebuild your website. Out of experience, the simplest and most cost effective solution is to just do the right thing and get the right technology in place. This nicely brings us onto how many websites end up in this situation. Generally speaking, experienced WordPress developers do not purchase their themes from theme market places because they are often utter garbage when it comes to how they have been built, how they are maintained and most importantly how difficult they are to use from a development point and also for users. Often we find that when businesses come to us with WordPress related problem that they are struggling to make the changes that they want to the website, this is often down to either their self or their last web developer who has decided to purchase a $60 bargain basement theme from one of the theme market places because it looked pretty. Sadly, we’ve yet to experience a good result when businesses have gone down this route. If this relates to you, do not be offended when we refuse to work with your current theme and can only help when rebuilding your website with leading technology. We often find with themes that have been purchased from theme market places is that the theme will be bundled with a bunch of plugins, aka additional functionality, which is never a good solution. As mentioned previously, themes and plugins are being continually updated with new features and security patches. You tend to find when you purchase themes from theme market places that these themes aren’t that up to date and often when a security patch is announced then the theme author doesn’t update the theme which results in your website being vulnerable and open to being hacked. Quite simply, plugins should not be bundled into themes. Plugins should be stand alone separate systems which users have the option of updating separately and most importantly turning on/off the functionality as they need. If you are in a situation whereby your theme has multiple plugins bundled into it, be very wary and you’re probably going to hear those words from us very soon… You’re going to need a new website. We’re going to be covering this topic in much more detail in another blog post. For now though, let’s keep things simple. As WordPress powers over 23% of websites on the internet, it is naturally a target for attackers. These are often not targeted attacks but are vulnerability attacks. This means that a robot will run through all websites on the internet, identify what version of WordPress a website is running, what plugins and themes the website is running then most importantly check for known vulnerabilities for these websites and hack into them, fully automated. Some of the largest causes of hacked WordPress websites comes down to lack of security updates. This is in the form of theme updates, plugin updates and WordPress core updates – or lack of all of these. Quite simply, you need to keep your entire WordPress website up to date to avoid being hacked into. The choice is yours. Well, yes, in theory. The reality of this can be very different based on how your WordPress website has been put together and most importantly what technology has been used and how good the web developer you used was. The reality of many websites we see is that things are so difficult to edit from a novice user point of view that this results in all changes needing to be made by an expert or a web developer which is kind of missing the point of WordPress. We see content stuffed into sections of WordPress which were never designed to hold such content, we see content that is stuffed away in PHP files which users cannot edit their self, and we see content hidden away in a complex array of plugins and hidden settings and more. Most WordPress websites have been built without the user in mind which we just cannot understand. From our perspective, we do not want to be spending time editing text content on your website. This is not a good use of your budget and quite frankly this is something you should be doing yourself, it is your website and your business. We can work on the more cool pieces of functionality and integrations that is going to grow your business. Quite simply, if you are struggling to edit content on your WordPress website then it has probably been built extremely badly. So don’t be surprised if you soon hear us utter the words… You’re going to need a new website. As it will be much more cost effective in the long run when you can run your website as you need to. We still see so many issues related to ownership of your own website. You need to have access to your WordPress login area as an Administrator, you need to have FTP access to the web server where your website lives, you need to have control panel access for your web server. To keep things simple, you need to be using our free Digital Assets Tracker to keep track of who owns what and who has access to what. Ahh… one of the common starts of sentences which really translates to “I don’t want to pay you for this, so could you just do this for free?” Sorry, no. You wouldn’t ask a car mechanic after fitting a new tyre, “Could you just wash my car too?” Website development is no different. What you may see as a simple thing to do, often actually isn’t and requires a reasonable amount of time and customisation to get right. You need to understand the time involved in aspects of work, so don’t be offended when we can’t just tweak something for free. We can quite happily provide a quote for the work and you can then make the decision to either go ahead with this work or not, this is your website after all. I’m sorry, WordPress just doesn’t work like that. The theory of WordPress means that you should just be able to place a new theme on your WordPress installation and everything looks different. The reality is hugely different. If your website isn’t responsive currently, then quite simply you are just going to need a new website built to cope with this. Responsive web design is a whole topic in itself which we will be covering in more detail in a future blog post. What is important to understand though is that the basics of responsive web design mean that you have the same content accessible which is just presented in a slightly different way. Note the use of the word slightly here. Responsive web design is not a framework for showing users different content based on the device they are using, that is adaptive web design. Responsive web design is about re-jigging things a little based on the user’s device which is significantly different. For example, responsive web design just doesn’t work when you want things such as “I don’t want this section to display for users on mobile devices”. The technology simply isn’t designed for this, so again, don’t be disgruntled when we say that this cannot be done. Overall this blog post is not designed to be a moan about problems we see. No. Instead this blog post is designed to help you understand where we are coming from when we say different things during discussions. Most importantly though, by understand the concepts above and how this relates to yourself, this will hopefully help you to avoid making the same mistakes as others and also be able to plan for the right technology improvements that you are going to need within your business. It is extremely important to help your customers find the information they need to make an informed purchasing decision. 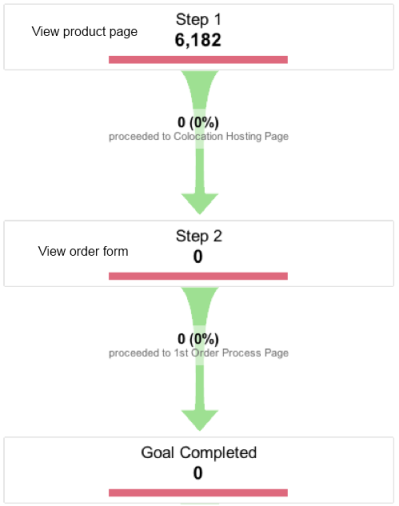 Often I see websites who are extremely focused on pushing customers down the standard conversion funnel that has been set up within an analytics package. Whilst this is a nice (and essential) thing to have which allows you tobenchmark different time periods, it is also important that the majority of people will never run through your conversion funnel step by step in the way that you would like. The general approach by many websites is to push people down the standard conversion funnel to increase the amount of people who ultimately buy. Often this includes removing any ‘distracting’ areas on the pages so that a customers focus is purely on making the final purchase. I tend to see this in a different light since most customer journeys aren’t quite as straight forward as that and can often look similar to the image below. Whereby a customer is flicking backwards and forwards between different pages whilst trying to double check things or look for moreconfirmation that they are doing the right thing by purchasing your product. So how can you get more people convert without forcing them down the standard sales funnel? Simple really, help them find the information they need and overcome their fears of purchasing. Put yourself in the customers shoes and understand what they really need when purchasing a product. 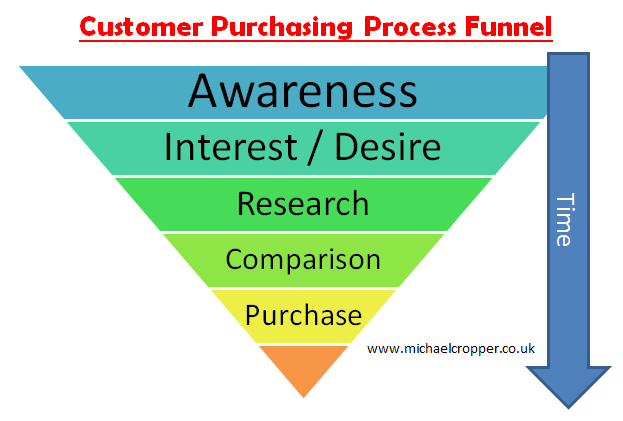 Also understand where they are in the greater purchasing funnel, are they just in the research stage of their purchase or are they ready to purchase immediately? An interesting quote from Google recently was that customers who book a hotel room check, on average, 15 other travel websites prior to making a booking. 15 other websites! Try tracking that in a normal conversion funnel. Another quote was that 70% of people who book a hotel view a map of where the hotel is located prior to booking. When trying to increase conversion the question should be asked, “Why does someone go to 15 other websites before booking? What information is missing from our website that a customer feels they have to go elsewhere to find?” When you can answer these questions and incorporate the missing content on your website I can guarantee that your conversion will increase. If you have great content that is not available on competitor websites then a customer is going to perceive you as the more knowledgeable brand who will provide a better service. This is going to make people want to order with you. Stop pushing people down your standard conversion funnel. Instead start to create some great content which answers customers queries. When customers see how amazing and detailed you are at providing the answers they need then conversion will increase by default. Why would a customer buy a product from someone else who doesn’t have a great website/detailed information if the cost of the product is the same? Yes it is important to track everything and I am not saying not to do that, but understand that the buying process does not happen by someone visiting page 1, then page 2 then purchasing. The buying process for any product is complex and you need to be offering information every step along the way. Purchasing is a multitude of different browsers, multiple tabs, multiple devices, various research on your site and off your site, then coming to an informed decision that you are the best option for them to purchase from you. Give customers what they need at every step of the process and they will buy.